When applying sunscreen people miss on average 10 per cent of their face, the most common site for skin cancer, according to University of Liverpool research presented at the British Association of Dermatologists’ Annual Conference in Liverpool this week. More than 90 per cent of basal cell carcinomas, the most common cancer in the UK, occur on the head or neck, and between five and 10 per cent of all skin cancers occur on the eyelids specifically. 57 participants, male and female, were asked to apply sunscreen to their face with no further information or instructions given by the researchers. Photos were taken of each of the participants with a UV-sensitive camera before and after the application of sunscreen, with areas covered with sunscreen appearing black due to the UV camera. These images were then segmented and analysed by a custom-designed program to judge how successful each person was at covering their whole face. On average people missed 9.5 per cent of the whole face, with the most commonly missed areas being the eyelids (13.5 per cent) and the area between the inner corner of the eye and the bridge of the nose (77 per cent). The researchers then asked the participants back to repeat the experiment, this time giving extra information about skin cancers of the eyelid region. Armed with this information there was a slight improvement in the level of sunscreen coverage with 7.7% per cent of the face left unprotected. 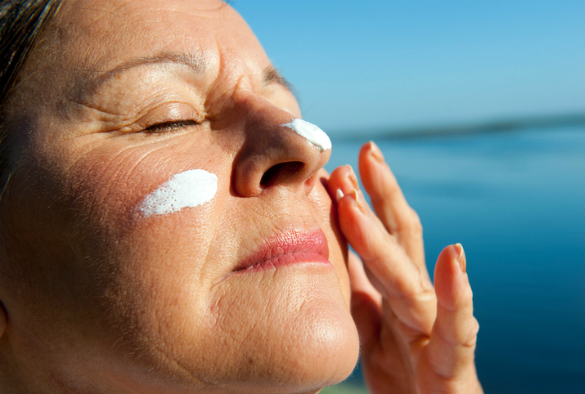 As applying sunscreen in these areas is not necessarily practical due to manufacturers’ warnings to keep products out of the eye, it is important to use other forms of protection such as sunglasses. UV imaging: The photo on the left is before sunscreen application. The photo on the right is after sunscreen application and shows the areas of skins missed around the eyes. Matthew Gass of the British Association of Dermatologists said: “As sunscreen is one of the main protections against UV damage and skin cancer it is vital that people understand how to apply it. Skin cancer is the most common type of cancer in the UK, and numbers continue to rise at a worryingly fast rate. Join Dr Hamill and colleagues at Liverpool World Museum this weekend to find out how effective your sun tan lotion application skills are. Using a UV sensitive camera, the team is offering visitors the chance to have photographs taken before and after sun cream application, to highlight any areas that have been missed. Visitors can also get a print out of the photo to take home.